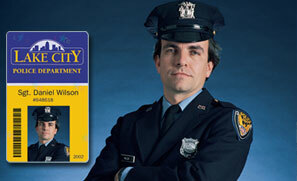 Personal identification is a key ingredient in every facet of law enforcement, fire protection, corrections and public safety. Identifying qualified First Responders may mean the difference between life and death in any emergency. An easily recognizable, secure ID card ensures confidence and control during natural disasters and is the first line of defense against homeland terror. At PlastiCard we understand the importance of providing durable and proven ID card systems for all aspects of public safety. Our solutions go beyond simple credentials to offer holographic designs for counterfeit-proof cards as well as solutions for child protection, gun owner registration, and secure correctional institution systems. The value of positive identification can not be over looked, especially at the very small cost of an up to date ID card. Please contact us for a free needs analysis and learn more about PlastiCard's complete line of law enforcement ID card systems, supplies and service.